Chef Craig hails from Canada’s Capital city of Ottawa where he began his culinary career. He started his kitchen work at many café’s and bistros in the Ottawa area working his way up to managing kitchens before heading off to formal cooking school in Northern Ontario at Canadore College to further his career. Upon his return to Ottawa he began to build a resume that would eventually lead to a career in teaching future chefs that was close to his heart. His career path included The Fairmont Chateau Laurier Hotel, Pastry and Garde Manger Chef at Claire De Lune Restaurant, then on to Executive Chef at the French Bistro Tete a Tete in Ottawa’s trendy West End. A move to Calgary brought Executive status at one of Calgary’s top restaurants at the time, Entre Nous. 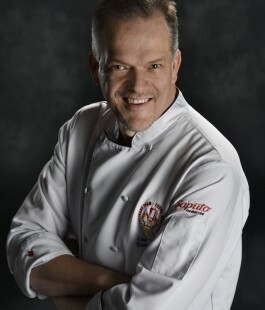 As a leading influence in the Calgary’s food scene, Craig was recruited by a top culinary school in Canada, The Culinary Institute of Canada at Holland College, where he ended up working for over 13 years with development of their wine programs, Applied Degree in Culinary Operations and he also managed to find time to complete his MBA from Guelph University where he received the Dorothy Britton Award each of his two years for top academic achievement. Chef Craig’s career has brought many awards and recognition that are too many to list. A sample of these achievements include a Gold Medal for the Blueberry Growers of Canada Recipe Contest in 1990, Gold Medal at the Canadian Chef Tournament that saw chefs from across Canada compete, a Premiers Award Nominee for Ontario College Graduates, and traveling the world to promote Canadian Cuisine including USA, Chile, Germany, France, Scotland, and a summer to teach in Szechwan, China. One of Craig’s crowning achievements was his role as Team Manager for Culinary Youth Team Canada from 2003-2008. During this time his team was 3rd in the world in 2003, Gold and Silver medalists at the Culinary Olympics in 2004, World Culinary Champions in 2007 and again Gold and Silver Medalists at the Culinary Olympics in 2008. Craig left the college to pursue a dream of business as Corporate Chef for a multi-million dollar restaurant group in Prince Edward Island that saw him head up over 15 restaurants. The chance to take his MBA “out for a spin” was too hard to pass up. Shortly after beginning with his new position Craig was approached to become the new Chair of Academics for the Canadian Food and Wine Institute at Niagara College. The strong culinary programs along with Canada’s only teaching winery, teaching Brewery and viticulture programs were perfect for Craig’s background and he has taken Niagara College and put them on the national and international culinary map. Craig has since gone on to become Dean of The Canadian Food and Wine Institute and looks forward to leading them into a bright future.